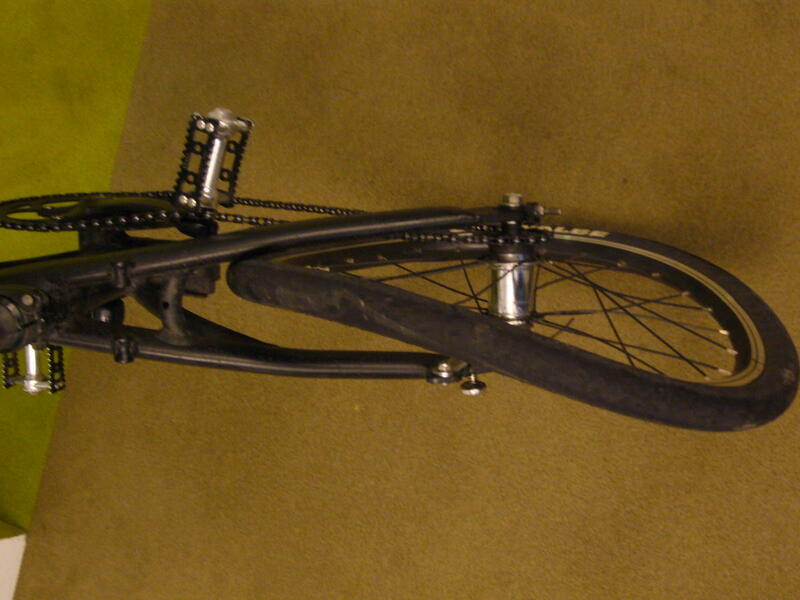 I’ve been waiting to tell the story of how a raging white van driver ran into me from behind and destroyed my bicycle. Now that everything is sorted out, I can. On Tuesday last week, I was cycling to work as usual. I’d skipped cycling in favour of the bus on Monday after my epic overnight ride to Dunwich, but I was feeling perky and energetic on Tuesday, so I decided to get back on the bike. It’s by far the fastest way to work, after all. Yes, I get sweaty, but we have showers at work, and you get sweaty on the Underground, too! I’d rather sweat out in the open air, on the surface of the planet where human beings live. My normal route takes me west along Shaftesbury avenue. There’s a central lane with its own set of lights to turn right up Great Windmill Street. From there, I go straight on up Lexington Street and left into Beak Street. Here’s a map. As I waited to turn right off Shaftesbury Avenue, it was clear that the driver of the van behind me was not particularly calm. He beeped impatiently even before the route to turn right was clear of oncoming traffic. He raced behind me up to the corner of Lexington Street and Beak Street, where I spotted him too close behind as I turned left. Now, Beak Street itself is one way, and, whilst it’s easily wide enough for two vehicles to pass, there are always delivery vans parked up the right hand side, leaving only a car’s width for moving traffic. Like most of Soho, it’s also quite extravagantly rutted and potholed. As I travelled along Beak Street, only a few hundred metres from work, I swung out to the right to circumnavigate a 20 cm-deep depression in the tarmac. As I returned to the centre of the lane, the white van was perilously close, apparently trying to undertake me (although there wasn’t space). He beeped. He then drove into the back of me. Driving like a maniac is not illegal as such, but undertaking is, and driving into the back of vehicles in front is definitely frowned upon. And, in any case, Beak Street is not a main thoroughfare: it’s one of the winding streets of Soho, full of pedestrians and shops. Not the place to be racing, especially when I was cycling at over 20 km/h in any case. Somehow, I jumped clear. I think I’d been aware of the danger, and prepared for the worst. As soon as the bumper touched my back wheel, I leapt off, landing on my feet safely in front, whilst my bike crunched under the front wheel of the van. If I hadn’t been riding a folding bike with a low crossbar, and if I hadn’t been riding flat platform pedals, things could have been worse. As it was, I was physically unscathed. —You braked! You were riding in the middle of the road! Was it my fault? In the sense that I was a cyclist and I existed, yes. In any balanced evaluation, no. —We’ve got the whole thing on CCTV! At that moment, two police officers turned up. They’d just started their beat and had been walking up Beak Street when they heard the commotion. With the police present, everything was sorted out rather quickly. One of them interviewed me; the other interviewed the driver. My police officer was friendly and we had a jovial conversation. I suspect that the driver didn’t enjoy his chat quite so much, as he was quite contrite by the end of it. The police went into the shop to review the recording, and pronounced their opinion that the driver was at fault. I went away with the details of the police, the eyewitnesses, and the driver—and of his employer. Oh, and a trashed bicycle. 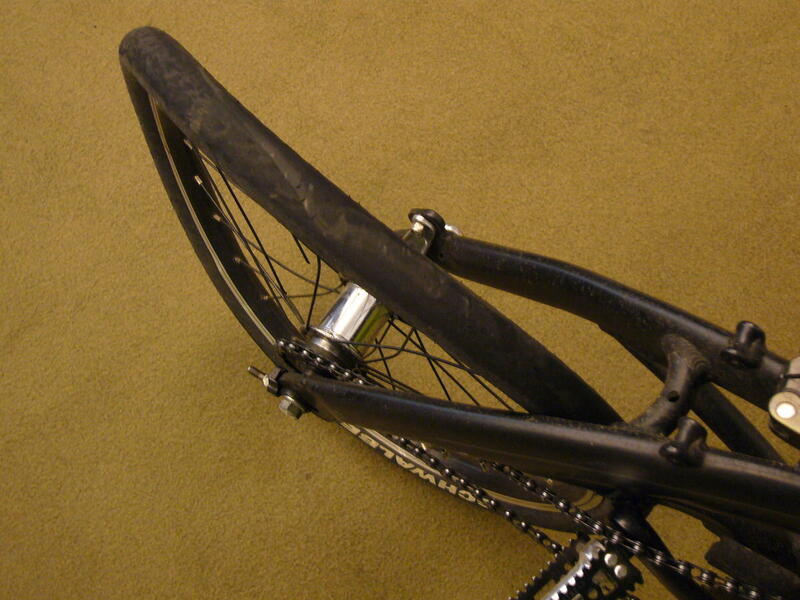 The rear wheel was destroyed. 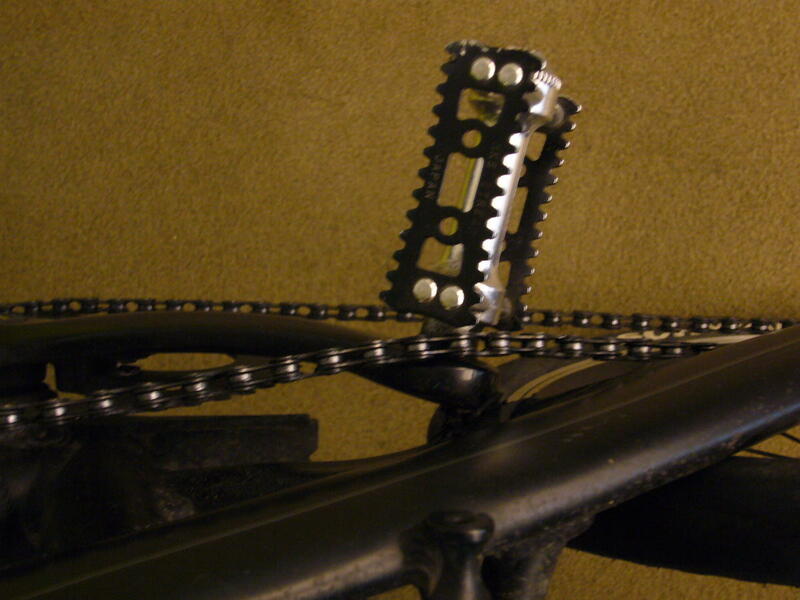 The pedals and chainset were bent, as was the rear part of the frame. You can’t just bend that back. For one thing, it would be difficult to get it to line up. For another, aluminium doesn’t thrive on repeated bending. As for the front half of the bike, well, it looked OK, but I couldn’t tell what stresses and distortions it had been subjected to under the van. In other words, it wasn’t something that I could safely ride any more, even if it were financially viable to replace the visibly damaged components. Back at work, I phoned up the driver’s employer (also the owner of the vehicle), and explained the situation. I expressed my opinion that it might be most straightforward for all concerned if we avoided an inconvenient legal or insurance procedure, and I suggested that they simply repay me the cost of the bicycle plus the customisations I’d made to it. They agreed. They sent me a cheque, which I’ve already cashed. They took away the broken bicycle today. Now, you might argue that I should have attempted to soak them for more money. Perhaps that might have worked. But it would have been dishonest. I wasn’t hurt, although I did feel a bit shaky for a couple of days. All I really wanted was my bicycle back. 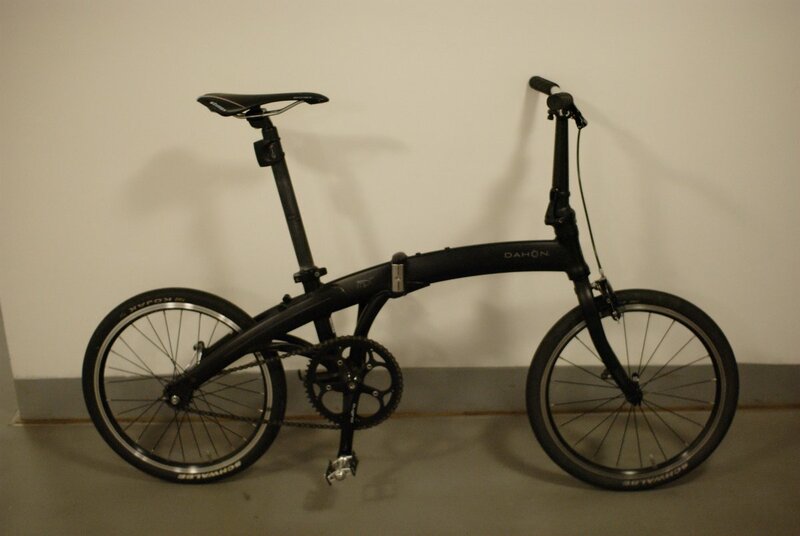 I decided to make some good out of the situation by replacing my bike with something better, so I have a superlight single-speed Brompton on order. It’s made to order, but should be ready in a month or so. The absurdity of the fact that I can ride 186 km to Dunwich in the middle of the night without incident, and then get hit riding 10 km to work at 10 am a few days later, has not escaped me. Meanwhile, my general distaste for Soho grows ever stronger. Frankly, it’s a shithole. But it always was a shithole. Some time in the last 15 years or so it became trendy: a trendy shithole, full of overpriced bad pubs and mediocre restaurants. In many ways, it’s still the same cramped, dirty, hostile, rat-infested quarter it ever was. The labyrinthine one-way systems make Soho a pain to get in and out of—and that’s even before you consider the throngs of tourists that infest the surrounding streets. No, I shall be very glad when we move out of Soho and I never have to go there again. Just one more month or so.